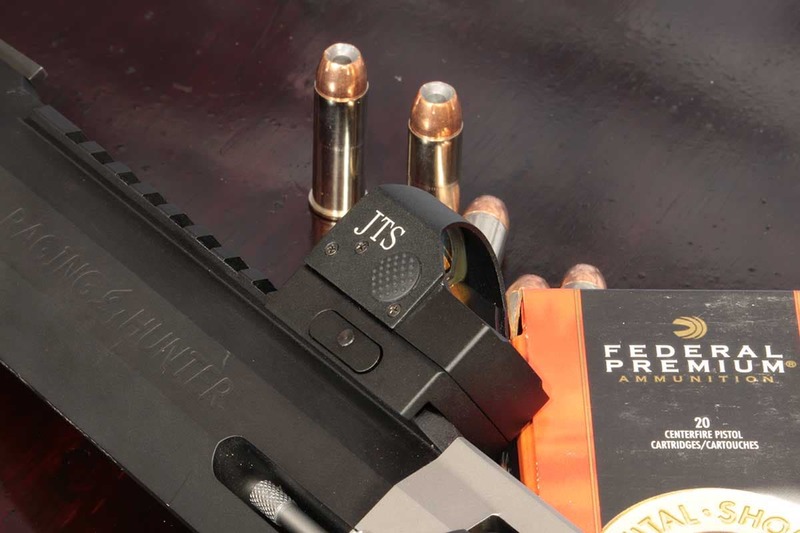 JTS is known for affordable AR and AK style 12-gauge shotguns with 3-Gun shooters and plinkers flocking to these modestly priced guns for their balance of investment and quality. 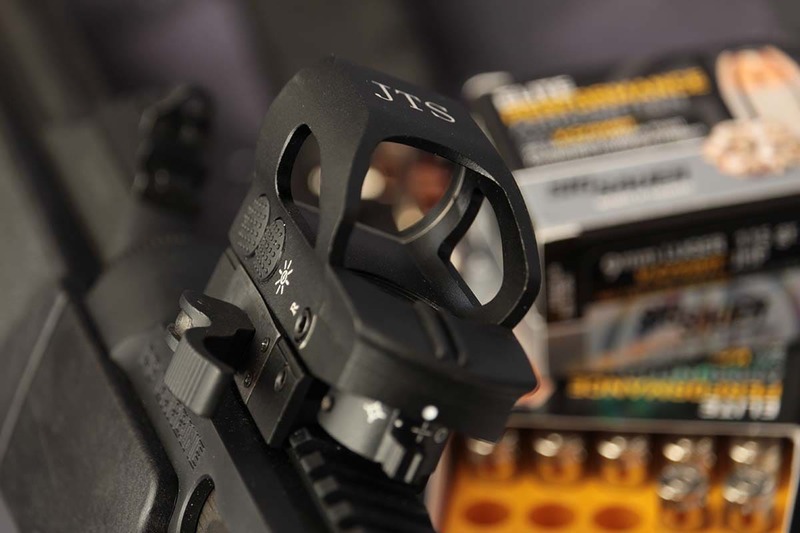 Now, JTS expands into optics, importing over a dozen different types of optics to match their firearms. I was lucky enough to gather a sampling and hit the range. Pistol mounted optics are commonplace these days with USPSA even allowing them with the adoption of the “Carry Optics” division. For my test, I worked with the JTSBJ300. Weighing in at less than 3-ounces I barely noticed it on the Taurus Raging Hunter .44 mag revolver. It comes screwed onto a Picatinny baseplate, but some simple gunsmithing can easily adapt it to other plates should the need arise. The battery is located between the mounting plate and the unit, allowing it to quickly return to zero after a swap. I zeroed it out and put close to 100 rounds of stout hunting loads through the gun. At the end of shooting, I didn’t experience a zero shift or malfunction from the JTSBJ300. Carrying a very reasonable price tag of just $59.99, this tiny red dot optic rounds out its features with five brightness settings as well as an auto shut-off when motion isn’t detected. Stepping up to the larger non-magnified optic, I mounted a JTSBJ200 to a Ruger PC Carbine and went to town. At 5.2-ounces it has the heft you would expect from an optic priced over $59.99. Installation took place right at the range thanks to an intuitive QD mount – literally, just snap it on and you are in business. Again, it zeroed quickly and maintained consistency throughout a 200-round test of 9mm +P Luger loads. The 200 series features four interchangeable reticles that are cycled through with the flip of a rear mounted lever. The JTSBJ200 uses a red or green reticle to compensate for either bright or dim light settings. The optic also comes with six different intensity levels for either color. For a more traditional 3-Gun style, I opted for the 1-6 x 24 JFS10249. Weighing 19-ounces it doesn’t feel “cheap” but at the same time doesn’t weigh the gun down like a brick either. Though this optic screams 3-gunner in looks it comes with over 200 minutes of adjustment, pushing .308 rounds past 1,000 yards. Locking turrets proved helpful, as optics like this aren’t generally dialed much after an initial zero. The locking turrets here really made sense. 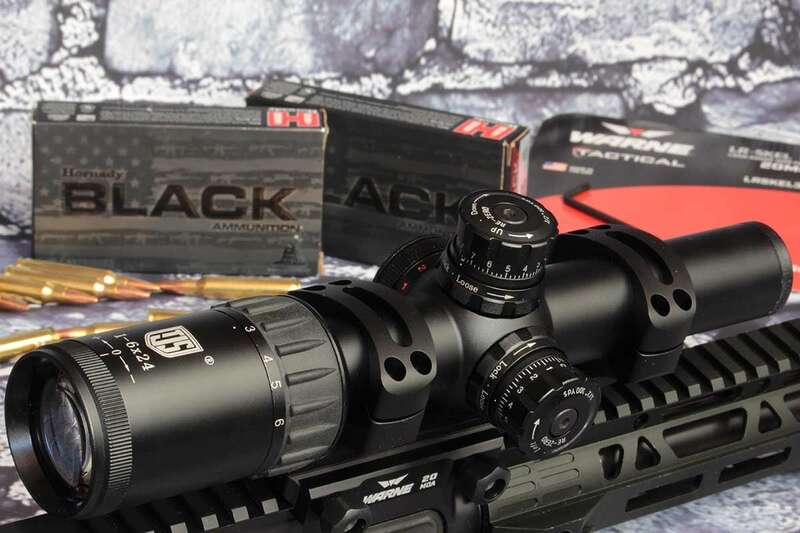 Additionally, this feature helps the scope retain zero through aggressive handling such as in practical shooting competition or hunting applications. The magnified optic offers a Mil-Dot reticle with 5 mils from the center to the bottom, allowing for compensation of a 5.56 NATO round all the way through its effective range. At just $169.99, this scope certainly gives more features than you would expect. Nothing is better for the shooting community than guns and accessories that don’t break the bank and don’t, well, break. I enjoyed my time on the range with these optics and intend to put them into service through the courses I teach.